Garmann doesn't exactly fit in well with his peers, and here his peers are a bully boy and the fence-sitting twins who fawn over him. When bully boy kinda-sorta dares Garmann to light some matches you have to expect what happens next: the overgrown grassland that is his neighbor's yard catches fire and everyone bolts except for Garmann who, oddball that he is, takes off his flimsy t-shirt and attempts to bat the fire down. But this incident exists to introduce Garmann to his neighbor, a retired postman all the other children (perhaps rightly) fear. He's a daft old man, this postman, who natters on about stamps and the number of days in a life and other bits of philosophy that would fly right over the head of most kids. In the end both Garmann and the postman are happy to have met, with a subtle indication that now that they have the postman can die happy. If my reading of this story is off it's probably because I was struck early on that in this sequel to Garmann's Summer we once again see a boy more socially comfortable in the presence of the elderly who appear to find comfort in the boy. It's as if Garmann we're Death's cute little boy from down the lane come to prove that his dad's not the meanie everyone thinks he is. "How could Death be so bad and raise such a nice, well-intentioned little boy," they might reason. And throughout there are visual clues – crows and dead trees and stamps of famous dead people – that suggest what the text does not: that the end is near for someone on that block. Most frustrating is how these other children exist as a measuring stick for Garmann, but their interaction is superficial at best, and are merely a flimsy shorthand for character types. True, outcasts often get their unfair share of bully boys and snooty girls, but there has to be something for them to aspire to, especially if the main character is a bit touched themselves. I feel like I'm missing something, or that something didn't translate well from the original Norwegian text. Is Garmann truly shy or is he just dim? Are these books intended to show children to pay closer attention to their elders, or is it just a romp where a boy deals with (as publicity material states) "the fun and crazy personalities" of his neighborhood? And, sheesh, are these digitally maipulated illustrations grotesque. I'm not saying picture books have to hold to some great barrier of beauty or whimsy, but they should at least be somewhat friendly. This is one of those books I bet no child picks up willingly, or asks to have read over and over. No child except Garmann, perhaps. David--I just read Garmann's Summer last month. I wondered if the author was trying to equate starting school with dying in that one. 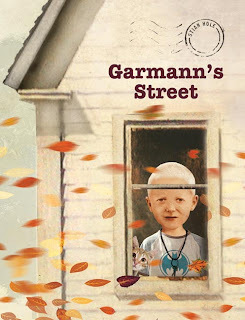 Knowing Garmann, as I do, I really enjoyed this review. Seriously! "Hmm, kids have anxieties about the first day of school... I know! Let's equate that fear with the fear of elderly aunts dying!"